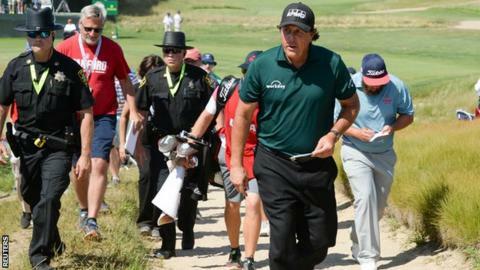 Phil Mickelson says he is "embarrassed and disappointed" after he putted a moving ball during the US Open. The American five-time major champion, 48, jogged after and deliberately prevented his ball from rolling off the 13th green during the third round at Shinnecock Hills on Saturday. The United States Golf Association (USGA) gave Mickelson a two-stroke penalty instead of disqualifying him. "It was clearly not my finest moment and I'm sorry," he said. In a text sent to reporters, Mickelson added: "I know this should've come sooner, but it's taken me a few days to calm down. "My anger and frustration got the best of me last weekend. I'm embarrassed and disappointed by my actions." With his missed bogey putt appearing to head off the green, Mickelson hit it back towards the hole before eventually needing eight strokes to complete the par-four 13th. After his round, he said he quickly decided the two-stroke penalty would be better than allowing the ball to roll off the green. He accepted a two-shot penalty from the USGA for "making a stroke at a moving ball", rather than the more severe offence of "an action with the intent to influence the movement of a ball in play", which could have resulted in disqualification. Asked why Rule 1-2, which covers a ball being "influenced or deflected" and can lead to disqualification for a "serious breach" was not invoked, John Bodenhamer, the USGA's senior managing director of championships and governance, said: "Phil didn't purposely deflect or stop the ball, which is talked about in the reference under Rule 14-5. He played a moving ball." Mickelson celebrated making par on the 13th during his final round on Sunday by raising his arms. He finished in a tie for 48th place, 15 shots behind compatriot Brooks Koepka, who defended his title. With Harry Kane injured and probably out of this year's Golden Boot race, we've challenged you to name the previous winners since the year 2000.